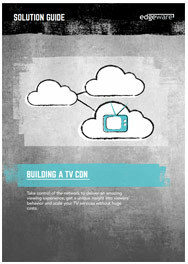 When should you consider building your own CDN for TV? General-purpose CDN services were developed to distribute large amounts of frequently used content – such as PC software updates – but they were not optimized for TV. They may deliver content via lowest-cost peering points or from wherever they have spare storage capacity – and they are not built for real-time service delivery. If you are a network operator, broadcaster or content owner, then building your own TV CDN can make more sense than buying in general-purpose CDN services – reducing your costs, improving the quality of your delivery and giving you greater insight into your viewers. And the greater the density of viewers in any geographic area, the greater the benefits. Get our free solution guide here.